The second event in the “National Geographic On Campus!” series will take place on May 7 at Boğaziçi University in Turkey. The joint event by Sabancı University Istanbul Policy Center, Boğaziçi University Agricultural Platform and National Geographic, will bring together photographer and author Reza Deghati, whose photographs appeared on the covers of various magazines such as National Geographic, Time Magazine and Newsweek, and 2017/18 Mercator-IPC Fellow Barış Karapınar, climate change expert from the United Nations Intergovernmental Panel on Climate Change. 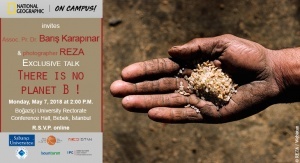 The panelists will discuss the effects of climate change on food security and poverty.